It’s been a busy, busy year so far! I’ve had deadlines, and I’ve been working on a variety of different things — that helps keep me from getting bored, and it keeps everything moving along. I have three quilts to trim and bind. I’m planning to get the bindings on today, and take them with me to my sister’s tomorrow, and hand stitch them down during the Super Bowl. 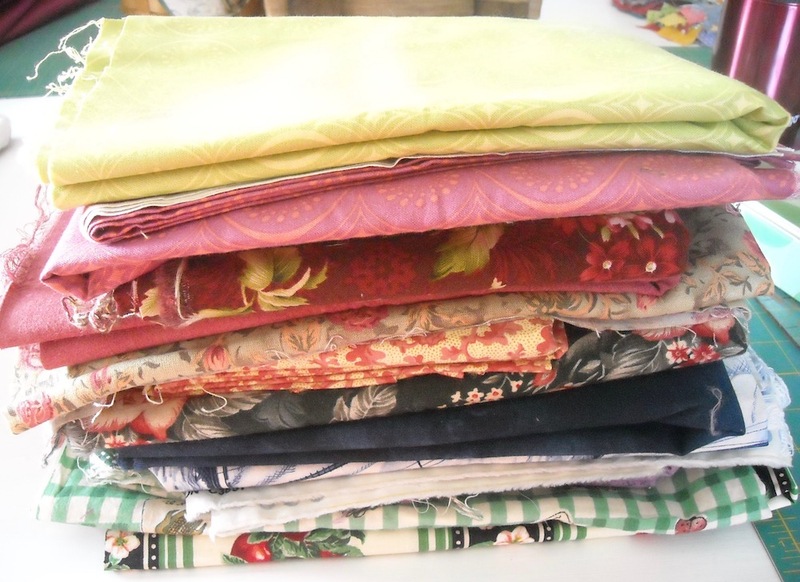 I have plans to make 50 pillowcases this year, so I pulled out a stack of fabric to use for getting started on those. My guild donates pillowcases to the nursing homes in our area, so I figured it’s a good way to use up a lot of stash. This pile seems to be more geared toward women — florals and such — so I also need to dig out some that will be good for men. One of these will have sailboats on it, but I probably have some tractor fabric somewhere! And I sorted out some more strips to use for my scrappy Rail Fence quilt I’m working on. I’m also working on the designs for the upcoming Block-of-the-Month quilts for Sew Sweet Quilt Shop, which will start in September. 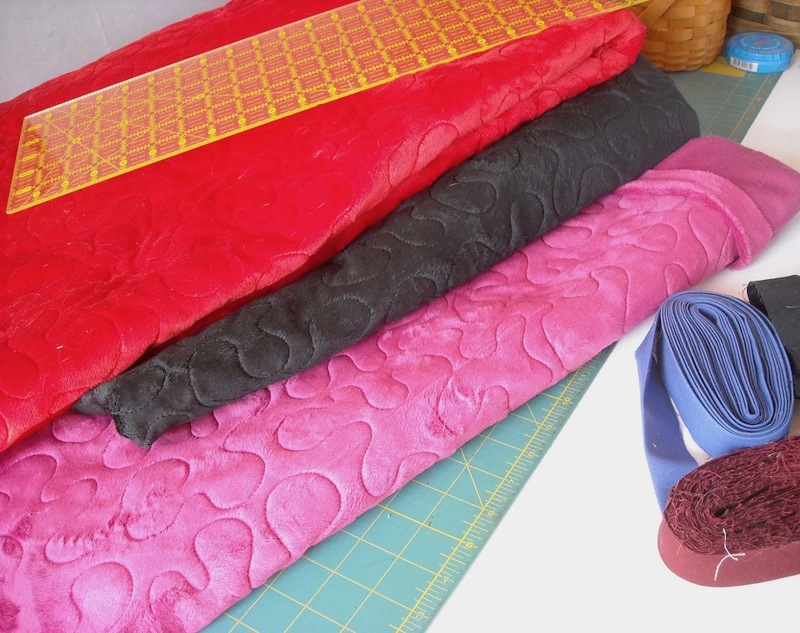 There’s a lot of behind-the-scenes work that goes into getting these quilts ready to be offered up during their program, so I’m trying to get an early start. It’s a nice sunny day here, and I’m working where I can see out the window to keep an eye on my goats. Ginger miscarried her twins over the last 24 hours, but she’s doing OK.
I’m sad that I won’t have those little babies to watch and play with, but hopefully everyone else will do fine. They’re not due until late March/early April, although Pepper looks like she’s ready to explode! So that’s what’s been going on around here! What have YOU been getting done? I keep going forward. can’t say I’m working on much of what I really want to. I have a quilt to quilt for a friend today and I will load the T-shirt quilt and get it started. I want to make 3 BOM and get those out of the way before the new week starts. You have been busy. Sorry about the babies, Ginger is pretty. Jan has been non quilted sewing until this week. Have the 54 blocks together for the twin quilt for my grandson. Needs border and then quilting. Valances, shower curtain and several craft type things are finished. I love goats. They are so amusing. I’m so sorry you lost the babies. You are a very busy lady. Keep up the good work. You are an inspiration to many. I told you we had goats for a few years. SAd to here about the loss. You have been busy. Today I had the friends that are working on our Central Maine themed quilt. I got my Stephen Kings house block assembled… working on small animals from our area next. 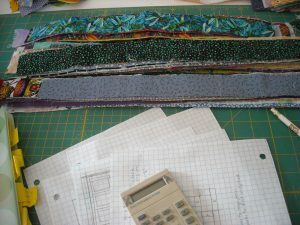 I also machine quilts lots of parallel rows on my black Savanah. Phew. And my studio is still pretty neat.. I am putting away surface tables that collect stuff. I continue to work in quilts that will be donated to The Linus Project and to a camp in Indiana dedicated to giving children living with cancer a week’s camp experience. Today I met with a group from my quilt guild to decide on borders for this year’s raffle quilt. It’s gonna be a beauty! I don’t see a way to include a photo or I would. Aww, how sad to lose the twin goat babies. You did very well, getting that cutting table clear again. I have been cutting too, preparing for a 4 days away from home retreat. I have packed plenty of stuff – new projects, last months blocks to assemble, additional pieces for UFOs, plus a few kits I cut last year. 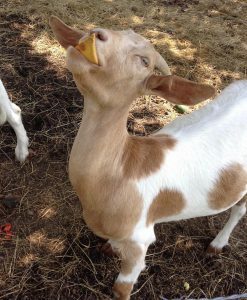 Ginger is real pretty, so sad about loss of the baby goats. Glad you were able to get your cutting table cleared off in short order! I am a little jealous….hahaha, mine is still buried hoping to get some time tomorrow. Enjoy the game. Yesterday was the annual Sew Day for the Quilts of Valor Foundation. 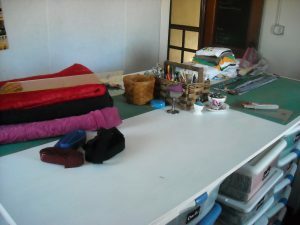 Like usual, I chose to work solo and was ready to start sewing early. Chose a simple pattern that showed off a gorgeous layer cake, Americana II by Penny Rose. As usual, I had constant interruptions. Completed only ONE row out of four and I was hoping to piece the entire top! I WILL finish the top today (just clicked my heels three times LOL)!! Sorry to hear about Ginger 🙁 I admit seeing that picture at the top of my blog feed this morning drew me right in. 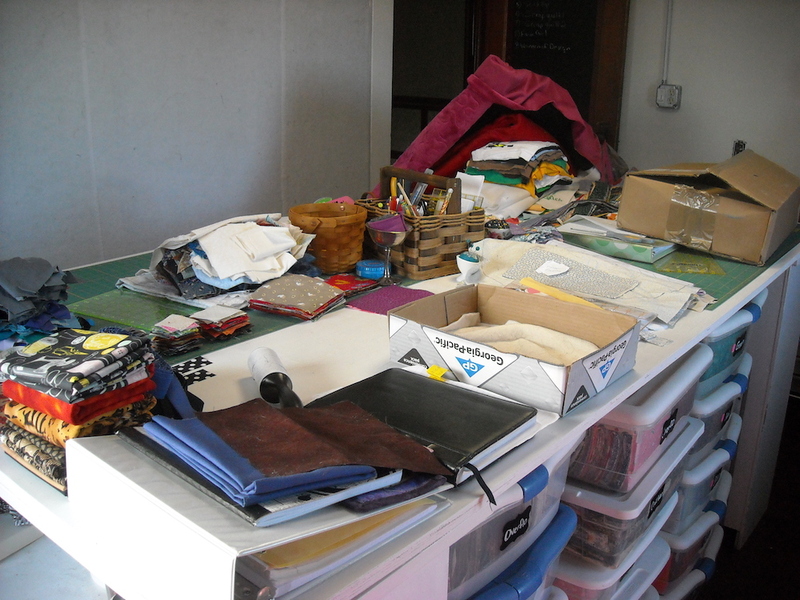 You’re not alone in your messes reappearing…every time I start working on a quilt, my entire sewing room reverts to messy. Having just finished a new quilt, I’m now immersed in tidying up so I can find back the one I’d been working on.